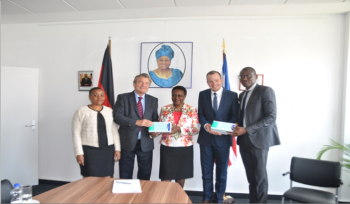 The German medical and pharmaceutical company, B. BRAUN MELSUNGEN AG, made a donation of 50,000 (fifty thousand) pieces of gloves to assist the Liberian Government in the fight against the spread of the deadly Ebola virus in Liberia. This donation was made possible through the efforts of Member of Parliament Thomas Stritzl, of Schleswig-Holsten and who is also a member of the Health Committee and the “Working Group Africa” of his party, from whom the Embassy sought assistance. Making the presentation to Ambassador Ethel Davis, at the Embassy in Berlin, Member of Parliament Thomas Stritzl, who was accompanied by his staff and Mr. Christian Clarus, Manager of the company B. Braun AG, extended thanks to the company B. Braun AG for their generous donation of 50,000 pieces of hand gloves to the Government of Liberia to assist in the fight against the Ebola virus. Parliamentarian Stritzl said that he was happy to be able to assist Liberia during this period of national health crisis and hope that the gesture of the Company B. Braun would serve as a model to other companies in terms of assistance.